Sentry #1 review – AiPT! Jeff Lemire and Kim Jacinto reintroduce readers to the Sentry in a solid debut issue. What if Superman always saved the day, but his heroic adventures took place exclusively inside Clark Kent’s head and, in reality, the only things soaring through the air are the burger patties Clark flips at his day job? Such is the premise of Marvel’s new Sentry series courtesy of writer Jeff Lemire and artist Kim Jacinto–the best take on the tragic life of Bob Reynolds to date! Following his return in the pages of rising star Donny Cates’ recent Doctor Strange run, Reynolds is doing his best to live a mild-mannered life and not lose control. Because while an out-of-control Bruce Banner eventually tires himself out smashing, the arrival of the Sentry can also mean the release of the hero’s alter ego: the monstrous Void. Fortunately, that won’t happen so long as Bob uses the Confluctor to travel into the fantastical world within his mind once every 24 hours. This world according to Bob is like something from DC Comics’ silver age with a horrific twist. You may have the Void turning every shadow in fake New York City into twisted monstrosities, but you’ve also got the Sentry’s trusted sidekicks: Scout, Sentress and Watchdog. And yes, you better believe Watchdog is a feisty, flying canine with a cape! It may sound like a lot–and even confusing considering Bob is three beings in one, but it all works with a writer as talented as Lemire at the helm. The creator responsible for Essex County and Sweet Tooth (among many other critically acclaimed works) may not have dreamed up the Sentry, but this debut issue has Lemire’s fingerprints all over it. Lemire chooses to reintroduce readers to the Sentry’s world (or worlds) as he puts us in Bob’s shoes for the day. We begin with the Moon-shattering action that comes with being Marvel’s answer to the man of steel, then slowly descend into the humbling reality the hero slogs through in between his escapes via the Confluctor. Is this out-of-shape, disheveled cook really the hero he pretends to be? And in a very Black Mirror-like move, did he really make his crush at the diner into his fantasy world sidekick? But then, those character flaws are what remind readers this isn’t Superman and they definitely aren’t in the DC Universe–this is classic Marvel Comics. 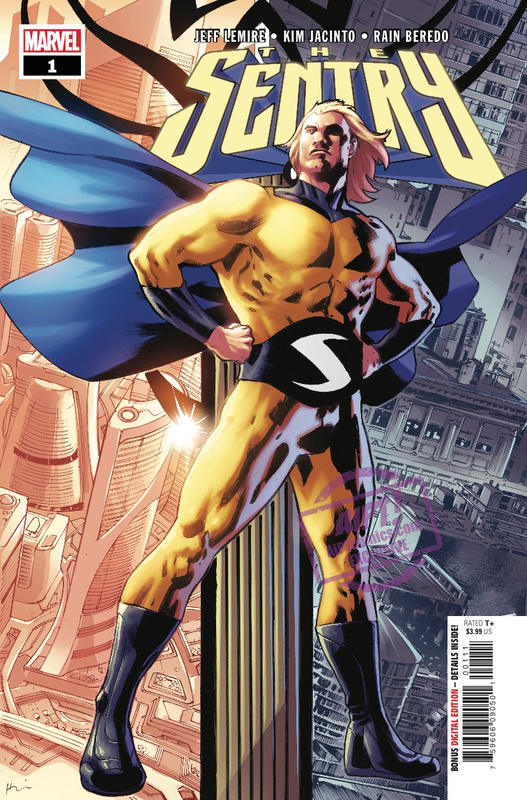 And speaking of Marvel style, let’s talk about Sentry #1’s art. Following the epic action that kicks off this issue, Jacinto’s artwork becomes more grounded, forcing readers to confront Bob’s less-than-superheroic figure and the tragic burden etched into his sunken face. Heck, Jacinto’s Bob and the supporting characters that surround him in the real world visually wouldn’t be out of place in Lemire’s Essex County–that’s how grounded these visuals are. I don’t think it’s a spoiler to say things never go Bob’s way, despite his best efforts. This issue’s shocking conclusion has me very excited for what awaits us in this unique addition to Marvel’s revitalized line. I’ve never been a big fan of the Sentry–or the Void– as writers’ use of the characters often left me frustrated or underwhelmed. And yes, even confused… did you know the X-Men’s leader (and non-telepath) Cyclops kept a piece of the Void locked away in his brain? Comics! But as I’m constantly impressed by Lemire’s inventiveness as a writer, I gave this relaunch a go and the results–as you’ll see in the review box below–are fantastic. Marvel’s got the makings of something special here, so take a chance and follow the Golden Guardian into a fantastical world where everything always works out in the end. Just kidding–it’s going to get ugly and that’s what makes it so hard to turn away! Both inspiring and terrifying, Sentry is as complex as the hero from which it gets its name. A perfect reintroduction to the tragic world of Bob Reynolds. Jeff Lemire and Kim Jacinto deliver a flawed hero in the proud Marvel tradition. Only one issue in and already the best take on the Sentry to date!